After checking “About Us” section on the website, we discovered that the broker’s headquarters is at Office 590, Suites 5 Horsfords Business Centre, Long Point Road, Charlestown, Nevis, St.Kitts and Nevis. The website is owned and is being operated by Advanced Technologies Ltd. Is Ayrex scam? Absolutely not. Ayrex is a legit brokerage firm, which is fully regulated by PRS. Furthermore, the broker is said to obtain CySEC license in the nearest future. Unfortunately, clients from the United States cannot test this excellent binary broker. Short Term options can be interesting for the binary options trader. Ayrex allows choosing the expiration time from 30 seconds up to 5 minutes. Talking about High/Low, it is possible to trade options for 15 minutes up to 1 hour. Lastly here, the trader can enjoy classic One Touch options. The expiry time here is the same as in High/Low. The platform currently does not feature Long-Term options, although they are expected to be added in the future. The platform itself is available in multiple languages, namely English, Bahasa Indonesia, Chinese, Italian, German and Bahasa Melayu. Ayrex bonus offer to mention is the 30% deposit bonus which is granted upon making the initial deposit. 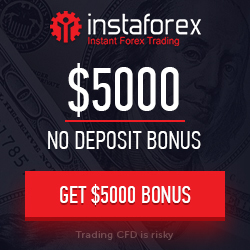 Additionally, all new clients can access $30 no deposit bonus. Ayrex also organizes contests for binary options traders on a monthly basis. Accessible 24/5, Ayrex support staff is ready to assist all traders via live chat, phone and email. The broker also offers FAQ, but it is still pretty basic. There is some room for improvement in this context. However, Ayrex website is constantly updated to please the traders with even better functionality. The minimum deposit requirement at Ayrex is only $5. Funds can be deposit using credit/debit cards (Visa, MasterCard), Skrill, UnionPay and FasaPay. In addition, withdrawals are made in the same way as the deposits. Please note that Ayrex does not charge any fees on deposits or withdrawals. Another fascinating feature is the automatic withdrawal function for Skrill and Neteller. It allows withdrawing funds in seconds and no commissions apply here. Money can be transferred whenever you wish so. Office 590, Suites 5 Horsfords Business Centre, Long Point Road, Charlestown, Nevis, St. Kitts and Nevis. 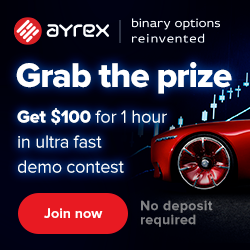 I have been trading binary options and forex before I heard about ayrex. In the beginning it thought it to be a bit of a downer that they only offer trades with a max duration of 1h. When I gave them a try however, I discovered quite a few very promising features that made me appreciate them more and more. The execution speed for instance is amazing : in the blink of a second your trade gets processed on every given moment, even in high volatility during market events ! The people at the help desk were very friendly, and don’t bother you all the time with calls or pushing you to deposit more. A very nice feature as well is their free signals, which have been working out quite well for me. What charmed me at lot finally, is that when you withdraw the money arrives in your account the very same moment. Platform usability is very important to trading if you don’t understand the platform you cannot make profit because you keep making mistake. I have used many platform and most of them is not user friendly you will need to start waiting for the customer care to teach you what to do and most of the time their not there to attend to you. But when i came to this Ayrex platform because I know that there are just two type of brokers Ayrex and others because this platform is so easy to use and understand even a learner can use it without any assistance. Most site that I have been fortunate to trade with are so heavy that if your network is not fast you will not succeed in placing a trade. Especially During news or when you see a very good signal the platform will be telling that the price has change. But with Ayrex this can never happen before the instrument finish loading if you place a trade it will enter and you will never experience repeat.